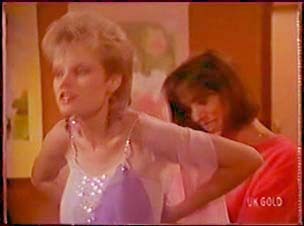 Daphne tells Julie to get lost. 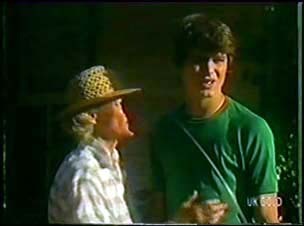 Paul tells Julie off for having a go at Daphne. Mrs Forbes says goodbye to Scott and Danny. Then they hear a gunshot from the next room. It turns out that Mrs Forbes hasn't shot herself, she's just let the gun off by accident. She's doing a bit of packing so she can go into care. Danny and Scott offer to stay on and help her to run the farm. But she says that they have to go home to their families. She goes to have a lie down. Danny tells Scott that they can't let Mrs Forbes leave the farm - he doesn't think she knows what she's saying. Danny says they'll have to prove to her they can do it. Scott wants to ring Jim to ask his advice. Danny tells him not to - the police are looking for them, after all. Scott says he won't tell Jim where they are. The phone rings and Jim answers it. Scott puts on a funny voice and says he wants to talk to Paul. Jim calls Paul, whispering that he knows it's Scott, but not to let on that he guessed. Paul comes on the phone and Scott talks in his normal voice. Scott explains the situation with Mrs Forbes. Paul says he'll have to give it some thought. Paul tells Scott that he's in the clear. 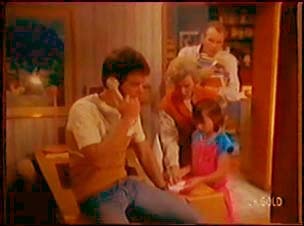 Scott starts to give Paul the number, but Danny pulls the phone off him and puts it back on the receiver. Jim and Helen have tracked Scott and Danny down. 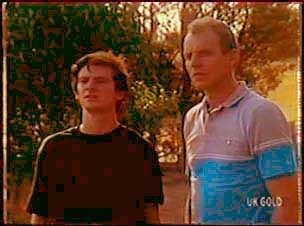 Danny tries to run but Jim tells him that they're both in the clear. 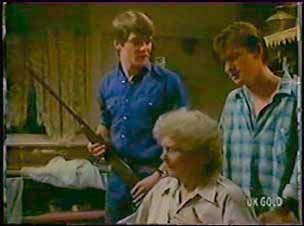 Mrs Forbes runs out to defend them with her shotgun! Danny is pleased that Max hasn't come with Jim. Danny never wants to see Max again. Shane comes round to pick Max up for work. 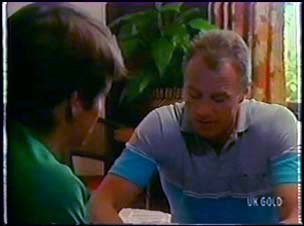 He tells Max that Jim has found Danny and Scott. Max seems indifferent to hear the news. 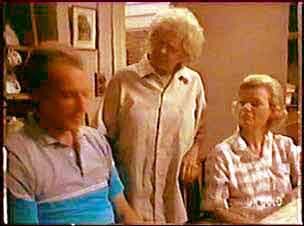 Jim and Helen are explaining to Mrs Forbes what happened with the police. She can't understand how anyone could have thought Scott and Danny were the culprits because they are "fine young lads". 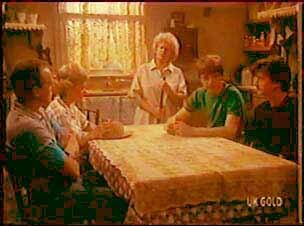 Mrs Forbes tells them off for not telling her they were on the run, but she understands why they did it. Jim says that he does, too. Nick is round having a chat to Maria. He invites her to go dancing this evening. She admits she used to love dancing, but doesn't think she should. Nick dances her around the kitchen but Maria still thinks she should stay home. Shane is trying to fix a tap while Max sits there impatiently. Shane is being driven to distraction! Jim has been looking at the books for the farm. He suggests that Scott and Danny gives him a guided tour. They take him off to show him the fencing they did. Helen says it will give her a good chance to ask Mrs Forbes how she gets Scott to do the dishes without questions! Daphne comes round looking for Maria. She needs her to help her out of her costume - the zip is caught. Maria tells Daphne how relieved she is that Danny has been found. They chat about Nick. Maria says she's not going dancing with Nick - people would talk. Nick comes round at that moment and Maria introduces her. He suggests an evening in with a video - for the three of them. Maria says she prefers his original idea - she will come dancing after all. 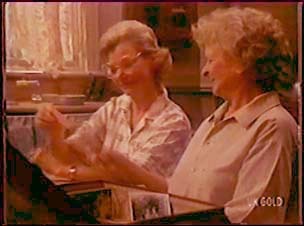 Mrs Forbes is showing Helen some old pictures of her family. Just then, Mrs Hammond from Welfare comes round. She's found Mrs Forbes a room at an old people's home. She agrees to take it. Then she excuses herself to go and feed the chickens. 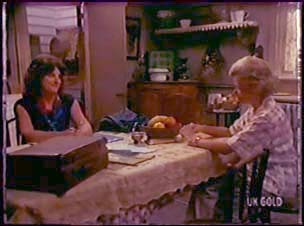 When Mrs Forbes has gone, Helen says that the old people's home is a very long way away - isn't there anything more local? Mrs Hammond says that there isn't. She says the old people's home is a very nice place. When Mrs Hammond has gone, Helen sits down and looks at the old photos again. Jim is admiring Scott and Danny's fencing. 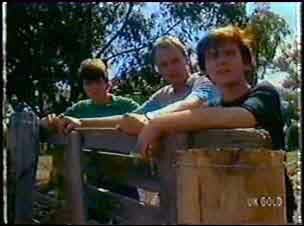 Danny and Scott say they want to stay on the farm - Mrs Forbes will teach them all they need to know. Jim says that he wants them to see the reality of the situation, but Danny likes it there - it's peaceful. It's much better than shouting at Max at home. 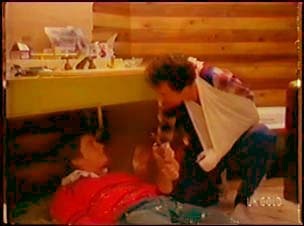 Jim says he can't make Danny come home. He invites Scott to come with him into town as he needs to get a room for him and Helen to stay in. The rented room is pretty dingy, but adequate. Jim and Scott sit down for a chat. Jim apologises to Scott for not believing him. He asks Scott to forgive him - his behaviour was inexcusable and he let Scott down badly.